2,684 backers pledged $380,058 to help bring this project to life. See below for special info about an Ultra Deluxe cover option! Currently the book is still being written and developed, so we aren't at the stage where we can put up the finished text, but we will be providing links to sections in progress in Updates throughout the course of this Kickstarter. The C20 manuscript printed out for proofing. This Deluxe Changeling: the Dreaming 20th Anniversary Edition Kickstarter is designed to enable us to create a deluxe hardcover edition that stands proudly on its own as an amazing volume, or together on a shelf with matching volumes of the Vampire: the Masquerade, Werewolf: the Apocalypse, Mage: the Ascension, and Wraith: the Oblivion 20th Anniversary Editions. This Deluxe Changeling 20th is planned as a black leatherette hardcover with an inset disk on the spine featuring the C20 round symbol, with 300+ full color, gold-edged, interior pages, and a gold silk ribbon bookmark. Embossed into the front cover will be the iconic luna moth Changeling symbol. Changeling 20th is finishing up the first draft stage of the writing process under the experienced eye of "Blackhat" Matt McFarland and we are running this Kickstarter for the Deluxe Edition now, at this stage, to insure that our backers have the chance to have a say in the kind of package we'll deliver. From comments, Rewards, and Stretch Goals, we will be working with backers to include their thoughts, names, and likenesses. So here now, at the last couple of days of this Changeling Kickstarter, we have a chance to scorn the banality of running out of time. We have a chance to create something wondrous! We have received tests from our printer showing that we can do an Ultra-Deluxe C20 with a cover that replicates the classic Changeling cover but in a transparent stained glass effect. Unlike previous Onyx Path Kickstarters with the Ultra-Deluxe option, we are not going to create a Reward Tier featuring the C20 Ultra-Deluxe and we're not going to have you add on to your pledges during this Kickstarter. If you have already made a pledge, DO NOT change your pledge by these amounts!!!!!! This is a different procedure than previous Ultra-Deluxes, so we do not want you doing what you might have done before, or changing your pledge like an Add-on product like the dice. If you are pledging for the first time right now, choose one of our Reward Tiers on the right of the KS page, and then follow the above messaging procedure if you are interested in the Ultra-Deluxe C20. We will be tallying the number of books from your messages and posting the current amount multiple times though the remaining days of this Kickstarter. If we reach 200 copies by the end of the KS, we will then be able to create the Ultra-Deluxe C20. We are doing this in this way so that if we fail to reach the 200 copy minimum for printing, no one has any money to keep track of or to deal with. If we do reach or go over the 200 copy minimum by the end of this KS, then we will let everyone know, and you will be asked to PayPal us the appropriate amount for your copies of the Ultra-Deluxe. It is our intention to ship the Ultra Deluxe version of C20 with the standard Deluxe Edition packages whenever possible, but we have no set dates comparing manufacture times. IMPORTANT FINAL NOTE! We will also be tallying the estimated amounts from your messages as well as the number of books. That extra amount of "Chimeric Pledges" will count towards reaching Stretch Goals and will also be announced multiple times during the next several days. If we reach and are paid for the 200 books printing minimum then we will deliver all the Stretch Goals the Chimeric Pledges attained as well! We will accept the PayPal payments from Jan 12th (the day we determine if we have reached the 200 book minimum) until Jan 20th. You are very much a part of this often chaotic and crazy process of creation with the Ultra-Deluxe C20! We've brought it this far as fast and as creatively as we could, and now you have the chance to be the heroes who can truly make it happen! It's pretty easy. Contribute any amount you want, bearing in mind the levels of contribution and their commensurate rewards over there on the right. If we hit our $50K goal, you'll get the reward that goes with your level of contribution. PDFs and Print on Demand versions will be made available first in the form of a coupon from our online sales partner, DriveThruRPG. 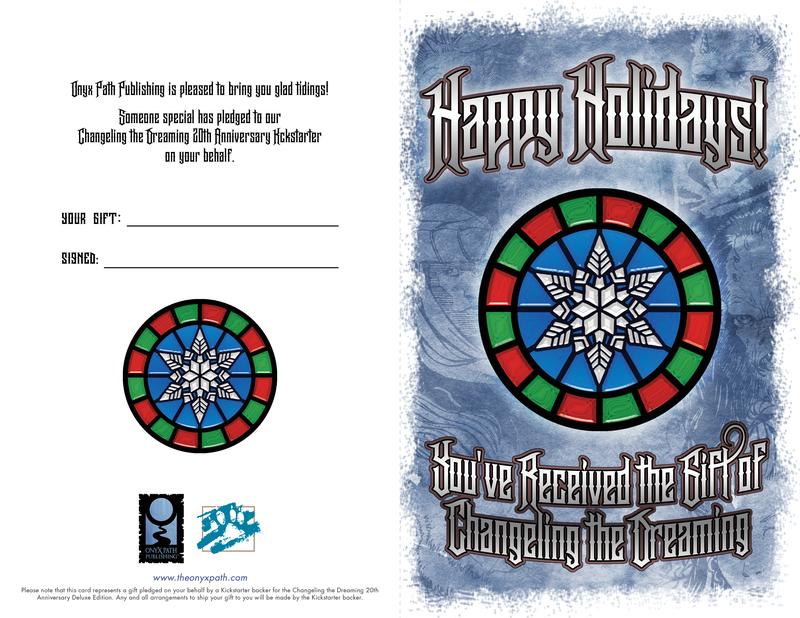 Also, because this C20 Kickstarter stretches through the holiday season, and we know a lot of backers like to pledge for Rewards as gifts, we've created a special Changeling 20th Gift Card PDF so that you can download and print it out for the lucky person you are gifting! If you are pledging for an electronic C20 Reward we will send the links to you, and you can send them to your special person. If you are pledging for a physical C20 Reward, like the Deluxe book, we will send that book to whichever address you include as the shipping address when you fill out the Backer Survey. Deluxe Changeling 20th Anniversary Edition will take multiple months from the closing date to print and ship. PDF Rewards and Add-ons will not take as long as the Deluxe, but will come after the Surveys are returned at least two months after this KS closes. We will contact contributors in the upper tiers with details on their rewards. + $10 for the three classic Immortal Eyes supplements and Immortal Eyes fiction trilogy PDFs. + $20 for the classic three Book of Houses supplements (Noblesse Oblige, Pour L'amour Et Liberte, Book of Lost Houses) PDFs. + $30 for an additional Changeling: the Dreaming 20th Anniversary Edition PDF. + $45 for the classic seven Kithbook and Nobles:The Shining Host supplement PDFs. + $160 for the entire classic Changeling: the Dreaming line PDFs. Every CtD PDF available through DriveThruRPG! Important: the above classic PDFs were created using the best methods possible depending on available files stretching 20 years back. Therefore, the image quality of PDFs of the older books in particular may not be as good as PDFs for newer books. + $15 for the Changeling 20th Storyteller's Screen, a sturdy three-panel screen featuring the beautiful collage of Changeling 20th art on the outer side, and on the inside there's a selection of charts and other info to make the Storyteller's job a little bit easier. For the very first time with any of our Kickstarters, we are able to offer official deluxe dice! + $23 for the Deluxe Changeling 20th Dice Set, ten 10-sided dice designed to echo the classic Changeling stained glass motif featuring the Changeling moth created in cooperation with Q-Workshop. With this Kickstarter we are adding another way you can contribute to the project and have fun with Achievements. Below you'll find various kinds that require backers to perform certain acts, such as to take selfies and link to the pics, or to like our Onyx Path Facebook page. Achievements do not impact the stretch goals nor do they effect the success or delivery of this Kickstarter; they are offered as a bonus way to have fun participating and are entirely optional. The selfies will not be shared by us outside of the context of the Deluxe C20 Kickstarter (any you post as part of these Achievements are considered usable for promotional purposes by Onyx Path). We'll be counting the Achievements once a day, every day of this Kickstarter campaign. We will only be counting the links for selfies here on the Deluxe C20 KS general comments area (not on any Updates comments as those get too scattered to keep track of). You might note the use of the white rose and dark rose on the above Achievements. These are counted as Seelie and Unseelie points respectively, and will come into play as noted below. The three Achievements below are not predetermined as Seelie or Unseelie and you will have to tell us with your post which side, if any, you want to be counted for. Whichever court has the most once the Achievement is hit will get credit for it. Below are the two Achievement tracks for Seelie and Unseelie that will also be counted towards the main Achievement Reward totals, so any Achievements attained really count twice towards earning those Rewards! Achievements are designed as something extra to have fun with, so please do treat them that way. We want to see your selfies and your love of Changeling: the Dreaming! This is your time to shine! If we have contributions beyond our target number, we've planned many added rewards for contributors. Our range of possible Stretch Goal awards includes additional material in Changeling 20th itself, a possible Ultra Deluxe Edition, a fiction anthology, brand new Changeling: the Dreaming dice, and more. At $60,000 of contributions, once the Deluxe Changeling: the Dreaming 20th Anniversary Edition KS is over, we're going to offer an exclusive KS Changeling 20th shirt on our RedBubble store for sale at the deepest discount they'll let us do it for a limited time after which we'll change the design- and we'll tell you folks about it first so you can order one if you want. We estimate that you'll be getting about a $10 discount. At $90,000 of contributions, we will create a Changeling 20th Anniversary short story anthology PDF/ePub that will be sent to all backers who pledged for a Reward Tier that includes a Changeling 20th PDF. At $110,000 of contributions, we will add a @10,000 word section to Changeling 20th Anniversary Edition that describes how to create your own Kith. At $160,000 of contributions, every backer who pledged for a Reward Tier containing a physical copy of the Deluxe Changeling 20th Anniversary Edition will receive a copy of the "Guide to Freeholds" PDF, a new @20K word supplement to C20. At $175,000 of contributions, we will add two more silk bookmarks to the Deluxe Changeling 20th Anniversary Edition as the book is already growing with the added Stretch Goal text and one bookmark just won't do the job. At $200,000 of contributions, we will do our research and add the Kith from the WoD: France book (well, MdT: France) book, and the Kith from Trolls, Dreamers, and the Deep Woods (Trolle, Träumer, tiefe Wälder) to Changeling 20th Anniversary Edition. So, more text and page count and art for more Kiths! At $215,000 of contributions, we will add the legendary 14th House as a full House write-up to Changeling 20th Anniversary Edition. At $225,000 of contributions, we will work with Tony Diterlizzi to remaster his beautiful iconic full page art, and also add a new limited 15 backer Reward Tier that includes an 11" x 14" print of Leigh of the Sidhe signed and donated by Tony himself! At $240,000 in contributions, all backers will receive a custom C20 Soundboard with 12 Tracks to accompany the Changeling: the Dreaming 20th Anniversary Edition book from BattleBards. These tracks will enhance and add nuances to the experience of playing a Changeling 20th chronicle. The Soundboard will provide easy access to the audio and the ability to organize and play tracks on-the-fly. Play them individually or layer them and play multiple tracks simultaneously for added effect. At $260,000 of contributions, every backer who pledged for a Reward Tier containing a PDF copy of the Changeling 20th Anniversary Edition will receive a copy of the C20 Quickstart PDF, designed to get players started and playing with an introduction to Changeling. At $275,000 of contributions, we will work with renowned dice manufacturers Q Workshop to create a Deluxe C20 ten-sided die, and add Deluxe C20 Dice Sets to our Add-on choices. At $315,000 of contributions, we will create Kithbook: Boggans, designed to match the previous classic Kithbooks. Every backer who pledged for a Reward Tier containing a physical copy of the Deluxe Changeling 20th Anniversary Edition will receive a copy of the PDF. At $330,000 of contributions, you will enable Onyx Path to give the freelance creative team a +15% bonus to what they were going to be paid for their contributions to Changeling 20th. At $350,000 of contributions, we will add an expanded look at the Seelie and Unseelie Courts into C20 itself, including what they meant in the pre-Sundering times when the Kithain shared the responsibility of ruling, and what they have come to mean now. Also, how individual changelings relate to their Seelie and Unseelie Legacies, and how the switch between them happens in play. At $380,000 of contributions, we will work with original Immortal Eyes Trilogy author Jackie Cassada to create an Immortal Eyes sequel novel. The PDF/ePub version will be sent to all backers who pledged for a Reward Tier that includes a Changeling 20th PDF. At $400,000 of contributions, we'll expand the section on Chimera in the C20 book, providing more examples of chimerical objects and companions, and more information for troupes on how to incorporate chimerical "reality" into your Changeling games. Solution: We have successfully shipped ten Kickstarter projects and several more are headed to completion as you read this. All those books have taught us how the various pieces of the process works, sometimes painfully, and we have increased our ability to judge the various stages of delivery better with each KS. The book is almost finished in the first draft stage, and we are limiting the amount of new text from Stretch Goals and Rewards. "Blackhat" Matt McFarland is one of our most experienced and active developers, and has fulfilled a number of Kickstarters himself. Risk: Shipping costs soak up pledges that were meant to enable the creation of the Deluxe Changeling: the Dreaming 20th Anniversary Edition. Solution: Kickstarter shipping costs have continued to rise dramatically this last year, but we are aware of that and were able to find ways to work with shippers to bring down those costs - unfortunately, only to some extent as we have also needed to up the shipping charges- both methods allowing us to be sure that shipping doesn't eat up the pledge money supposed to go to printing. For the first time, because of Kickstarter adding the option to their tools, we are able to be more specific as to shipping costs based on your country. These costs will be added to your pledge automatically by KS if you are outside the US. As always, local or VAT style taxes will need to be paid by the backer when appropriate and are not included in these costs. You or your character's name will be listed on the credits page as one of our supporters: the army of the night. You'll get digital wallpaper featuring a collage of the evocative and beautiful art from Changeling: the Dreaming 20th. You or your character's name will be listed on the credits page as one of our supporters: the army of the night. • PDFs of the classic three-part Immortal Eyes supplements and the matching Immortal Eyes in-setting fiction trilogy. • You or your character's name will be listed on the credits page as an Arcadian Scholar. • PDFs of the classic three Book of Houses supplements (Noblesse Oblige, Pour L'amour Et Liberte, Book of Lost Houses). • A beautiful electronic wallpaper file featuring a collage of the art of Changeling: the Dreaming 20th. • A copy of the Changeling: the Dreaming 20th Anniversary Edition PDF. • You or your character's name will be listed on the credits page as a Fledge. • You or your character's name will be listed on the credits page as a Kithain Scholar. • PDFs of the seven classic Kithbooks and also the Nobles: The Shining Host. • You or your character's name will be listed on the credits page as a Scholar. • PDFs of the seven classic Kithbooks and also Nobles: The Shining Host. • The Deluxe Changeling: the Dreaming 20th Anniversary Edition physical book. • You or your character's name will be listed on the credits page as a Changeling. • Copies of all four previous 20th Anniversary PDFs (for Vampire, Werewolf, Mage, and Wraith). • The Changeling: the Dreaming 20th Anniversary Edition Storyteller's Screen, a sturdy three-panel screen featuring a collage of the stunning art from C20 on the outer side, and on the inside there's a selection of charts and other info to make the Storyteller's job a little bit easier. • The Complete Changeling PDF bundle from DriveThruRPG of every CtD PDF they have. • An option to purchase the Changeling: the Dreaming 20th Anniversary Edition Print on Demand (PoD) physical book as close to cost as we can give you (see description in the text to the left). • Two copies of the Deluxe Changeling: the Dreaming 20th Anniversary Edition physical book. • Two copies of the Changeling: the Dreaming 20th Anniversary Edition PDF. • Two beautiful electronic wallpaper files featuring a collage of the art of Changeling: the Dreaming 20th. • You can list two names (yours or your character's name, or one of each) on the credits page as a Changeling. • You or your character's name will be listed on the credits page as a Liege. • A print of Leigh (the full page sidhe character pictured near the top of te KS page) signed by Tony DiTerlizzi. • A bookplate signed by as many of the creative team as we can convince to enter Arcadia. • Your character's name will be used as a name within the text of an upcoming C20 book. • Your character's name will be used as a name within the text of the C20 anthology fiction book. • You or your character's name will be listed on the credits page as a Leige. • You will be used as a model for characters in an upcoming C20 project (you must provide photographic reference for the artists; we'll contact you with details). • A character sheet customized for your character and including a portrait by Ken Meyer Jr of your character. • Five copies of the Deluxe Changeling: the Dreaming 20th Anniversary Edition physical book. • Five copies of the Changeling: the Dreaming 20th Anniversary Edition PDF. • Five beautiful electronic wallpaper files featuring a collage of the art of Changeling: the Dreaming 20th. • You can list five names (yours or your character's name, or a combination) on the credits page as a Changeling. • Five copies of the Changeling 20th Storytellers Screen as a Retailer bonus. • You'll be listed in the “Special Thanks” section and as a "Consulting Developer" you will have the opportunity to see every draft and be copied on every email between developer and writers pertaining to an upcoming C20 project.